A black and white negative of Russell (Russ) Hatch in his Whitby Volunteer Fire Brigade uniform. In the background is a wooden fence. Samuel Russell (Russ) Hatch was born on 10 March 1894 to Frederick C. and Fannie Hatch. Russell married Elizabeth Henderson Steele on 25 January 1922 in Fergus, Ontario. They had one son, Frederick Steele Hatch. Mr. Hatch was a veteran of both World Wars serving as a Lieutenant during the First World War and a Major during the Second World War. 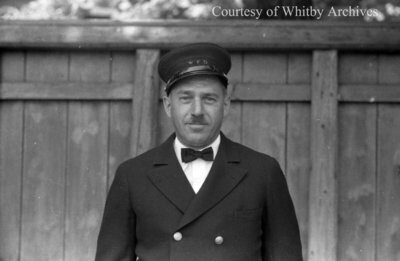 He was a member of the Whitby Volunteer Fire Brigade for fourteen years. Russell died on 14 October 1958 in Whitby, Ontario. He is buried in Union Cemetery, Oshawa, Ontario. Russell Hatch, July 22, 1939, Marjorie Ruddy. Whitby Archives A2013_040_728A.